Confirming earlier reports, Apple today issued media invitations for a special iPhone event to be held next Tuesday, October 4th at the company's Town Hall auditorium at its headquarters in Cupertino, California. The event is scheduled to begin at 10:00 AM Pacific Time. As noted by The Loop, invitations for the event carry the tagline "Let's talk iPhone" and depict iOS icons for Calendar, Clock, Maps, and Phone. Apple is of course widely expected to introduce its next-generation hardware (whether it be iPhone 4S, iPhone 5, or both) at the event, and is expected to also be including a minor update to its iPod line. iOS 5 and iCloud are also expected to be topics of discussion at the event, while other reports have indicated that Facebook may launch its iPad app at the event. Thank god. The rumors can finally stop! talking iPhones (hello siri + nuance)! I'm guessing that 1 means that there will only be one phone launched. That's what stands out for me anyway. 1 "new" notification on the Phone app... perhaps to quell the expectations of 2 new phones being released? or with 4S being an update, the 5 is the only new one? Everytime one of you knuckleheads writes iPhone 4s I want to slam my man-bag in a sliding glass door. 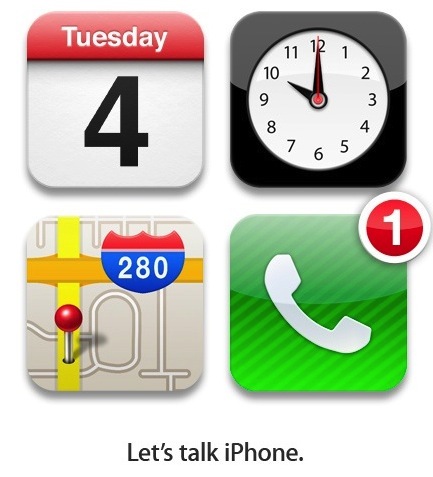 They aren't just the icons -- it's telling you what day, what time, where it is, and then iPhone. Pretty clever! Sweet tapdancing Jesus... did you guys notice the apostrophe in "Let's" on the bottom? Call me crazy, but I counted 392 pixels in that apostrophe! We all know what that means! Add the 4 and 5 in "iPhone 4S" and "iPhone 5" ... That's 9! 9 x 4 (the day of the announcement) is 14! 14 x 7 (the number of letters in Tuesday) is 98! 98 x 4 (the number of waffles Tim Cook had this morning) is 392!! !